Gain up to +39 hp/+69 lb-ft. Reduces exhaust gas temps (EGTs) and smoke. Outflows stock and competitors up to 57 Percent. Optional Super-Scoop rams cold air for more power. Passes the test. Again and again. Others build and ship without testing. Not Banks. Our Ram-Air Intakes start out as CAD software prototypes and are put through flow simulations. The design is refined until the simulation shows optimal performance. Then a hardware prototype is made and the design is validated on a flowbench. After that comes dyno testing and on-vehicle testing. It takes a superior design to pass all those tests! Filter on a stick: a joke that’s not funny. A filter on a stick is a bad joke. It’s wide-open to hot, power-robbing underhood engine air. 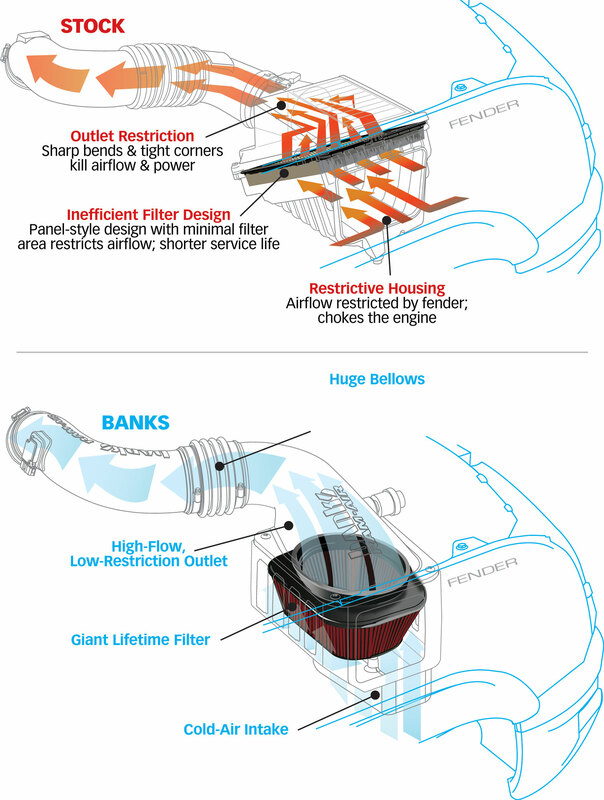 Ram-Air houses a giant limited lifetime filter in an enclosed cold-air box, which inhales cool, dense outside airÑmore than Banks’ competitors and up to 57% more than stockÑfor more power (up to +39 hp/+69 lb-ft , with tuner). More mileage, lower EGTs and less smoke, too.ÊAndÊit’s designed to not cause fault or error codes. 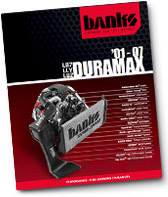 Banks Ram-Air is the only aftermarket intake with bellows. This accommodates engine movement and prevents component damage for longer service life. 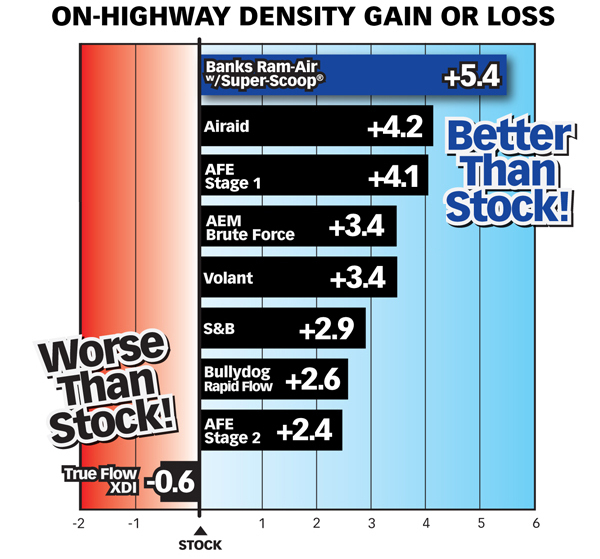 The optional high-flow Super-Scoop is another Banks exclusive! Note: This illustration shows a stock LLY intake so yours may not be identical. Best gains measured at the rear wheels. 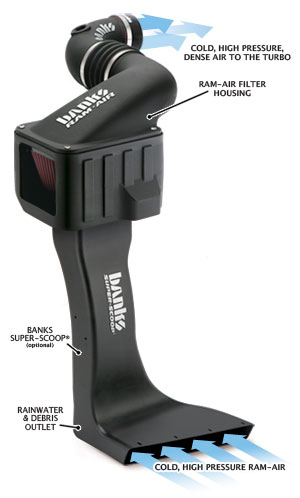 Available separately: newÊSuper-ScoopÊoptimizes the Ram-Air Intake's efficiency and power! NEW FILTER OPTIONS!ÊChoose from the traditional red, oiled filter or the all-new black, dry filter. Plus, you can even get an extra layer of filtration protection by adding a pre-filter to your order. 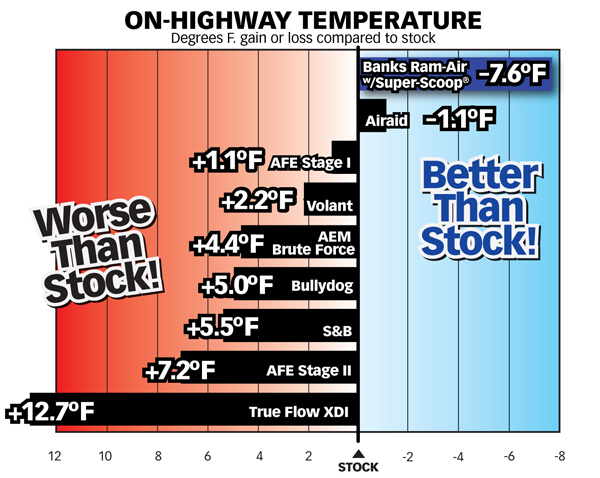 All 8 Intakes Perform worse than Banks! We measured each intake’s effect on air density at the turbo compressor inlet. Intake temperatures will generally be higher than ambient conditions, but the more the system can duct cool air to the filter and preserve the cool temperature as the air is ducted to the turbo, the higher the air density will be. In addition, there will commonly be a pressure drop as air travels through the filter and the ducting due to any restriction that is introduced. If the design of the system can minimize the restriction and the pressure loss, air density will be preserved. A 2006 Chevrolet 2500HD, 4 wheel drive, with a crew cab, six foot bed and automatic transmission was used as the test vehicle. 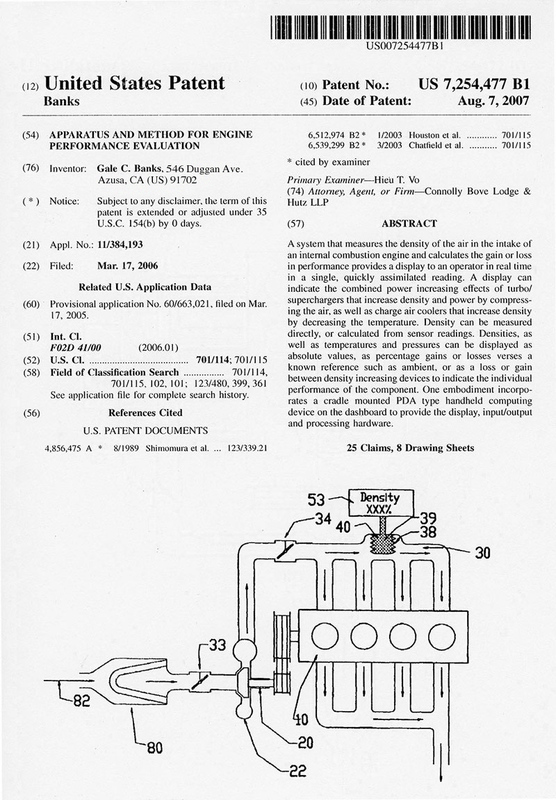 A data acquisition system was used to measure vehicle speed via GPS, along with multiple temperature thermistors and extremely accurate pressure transducers. The total vehicle weight was approximately 19,000 lbs. Tests were run in 2WD. Testing was conducted on a moderate hill on the northbound CA-57 in the city of Pomona. Speed was maintained at 45 MPH until the vehicle was adjacent to a pre-determined start point on the road. At that point, the accelerator was fully depressed and the vehicle was allowed to accelerate while climbing the hill. Test data was observed at the same vehicle speed in all cases, with the engine at 2800 RPM, the point of peak engine power. This data point occurred between 60 and 90 seconds into the runÑsufficient time to allow the engine to reach a stabilized operating condition. Vehicle Speed, Engine RPM and Accelerator Pedal Position were logged to determine the load conditions and speeds. Temperature was measured using thermistors for increased accuracy. They were mounted to measure ambient temperature as well as temperatures at the filter and compressor inlets. Pressure transducers were used to measure pressure in the same locations. The air intake system effect on air density was evaluated by comparing the temperature and pressure of the ambient air condition with the temperature and pressure of the air at the turbo compressor inlet. Why on earth would anyone pay money for a product that kills power and mileage? 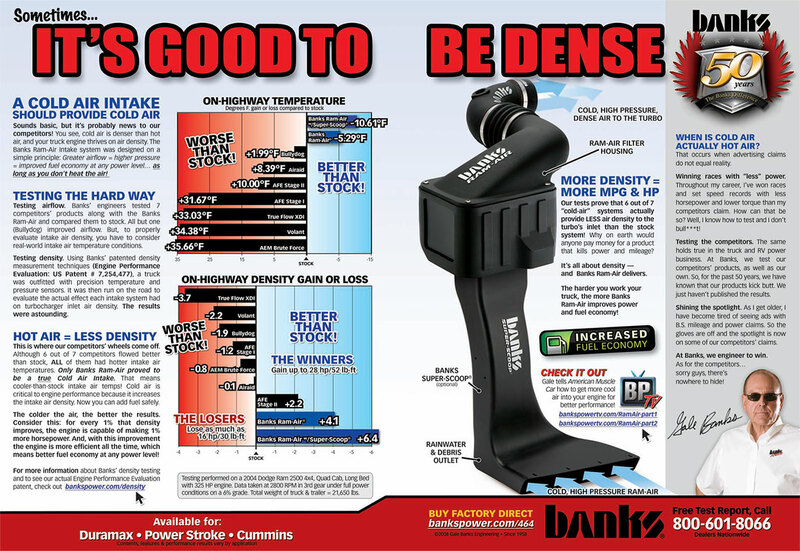 It’s all about density Ñ andÊ Banks Ram-Air delivers.